Merrie Wright is a professional ceramic sculptor who has lived and worked in east Texas for the past 11 years. Merrie Wright received a BFA from the Kansas City Art Institute and a MFA from Louisiana State University. She is currently an Associate Professor and Department Chair of Art & Art History at the University of Texas at Tyler. Wright exhibits her work nationally. 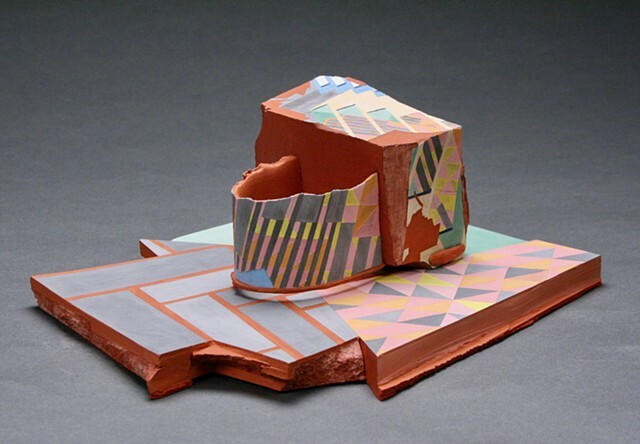 Wrights work has been featured in publications including: Ceramics Monthly, the CFILE Foundation online journal, Re/constructing Atlanta by Cathy Byrd, and she is a member of the Art Axis Database. Additional awards and residencies include the International Residency Award, through a partnership with NCECA and The Banff Centre in 2014, and a short-term residency at Red Lodge Clay Center, during the winter of 2016-2017. Continuous threads of investigation found in the ceramic sculpture of Merrie Wright include: the importance of time and place; the ability of the form/surface relationship to transform perceptions of time, space, or reality; and how patterns used for centuries by artists across cultures can speak to numerous hidden, ambiguous and enigmatic connections to the universe. Her process is labor-intensive, slow and meticulous. In an era of industrial processes and cutting edge technology she strives to push the material as well as her tool, the hand, to its limit. Wright does workshops and lectures for universities, art centers, and galleries. For more information or price inquiries/availability of works please send an email to merriewright@hotmail.com.